Please check the second edition! And there is also an open-source shape analysis library (Python) under construction. One of the most important, though relatively less acclaimed, effects of computer technology advances in the current century has been the maturing of shape analysis as a practical and useful theoretical and applied area. Since so many properties of objects in our world are strongly determined by geometric properties, the applications of shape analysis extend over almost every applied scientific and technological area, from the smallest to the largest spatial scales. For instance, the strength of composites is directly related to the shape of its constituent crystal grains, the shape of biological entities provide an immensely important clue about the interactions between themselves and with the environment. The relationship is no less dramatic at larger scales, where the properties of a wing design or a mechanical piece are almost completely defined by their respective geometry. Indeed, when properly and carefully applied shape analysis provide an exceedingly rich potential for applications in the most diverse areas, from material sciences to biology and neuroscience. Despite the particularly relevant role of shape analysis and its multiple applications as a modern applied area, just a few related books are to be found in the specialized bibliography. Yet, while the more specific texts are too technical, specific and/or advanced, more general books in computer vision do not cover the area in a comprehensive and up to dated fashion, being of difficult access to non-experts interested in the specific issues of shape characterization and classification. The present book has been primarily conceived as an introductory textbook in these areas. 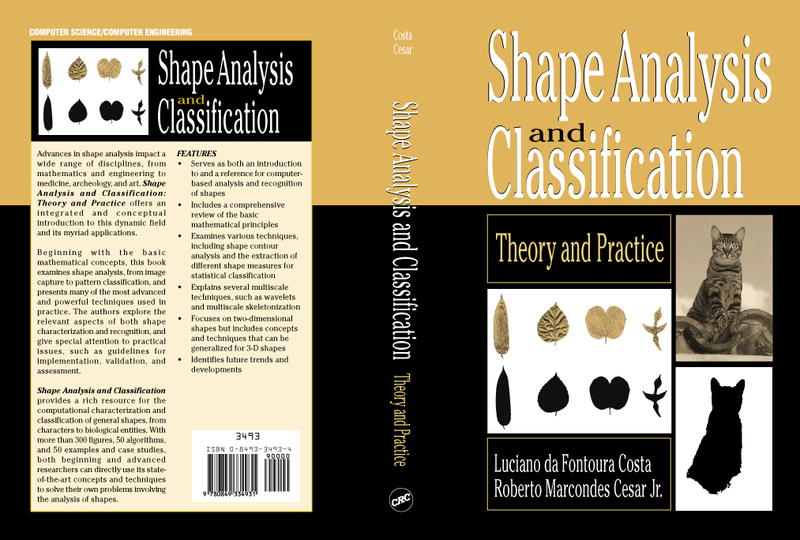 Indeed, in spite of its introductory nature, it presents in an integrated and conceptual fashion many of the most advanced and powerful shape analysis techniques, including multiscale approaches, numeric tools for morphometric characterization, as well as a comprehensive review of the main approaches for shape classification. It has been prepared with special attention in order to allow effective implementation and application of the presented material.